No idea what the Reserves XI were playing at with their batting today. Perhaps they wanted to get out quickly so they could have a pop at winning tomorrow. I’d have put the boot in and enforced the follow-on, though. The fact that Sri Lanka have a lot of left handers in their line-up, makes Hoggy a great pick also.. I remember reading somewhere that he’s up there with the best at taking wickets against the left handed freaks.. I want the yeomans children. 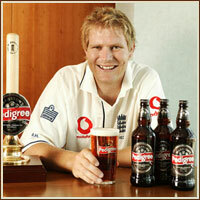 Hoggy is also my Favourite Cricketer of All Time. That’s reason enough to pick him. He’s sort of like the small mutt at the pound, everyone looks at the big cool dogs, but none of them can bowl. Hoggy’s DEFINITELY not some small mutt. Nope. He’s actually a great big shaggy Olde English Sheepdog — while the flash harry terriers, Alsations and poodles strut their stuff and do fancy tricks, Doggy Hoggy just sits there and has a nap. Then he goes out, sorts out all the sheep, and ambles back in time for bed. Job done, Hoggy-style. There’s probably mint sauce involved. This is for you Lemon Bella, and the rest of you wil enjoy it as much, I’m sure! Hoggy and a heffalump having hijinks!. 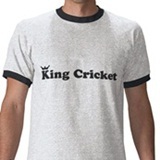 What more could any real cricket fan want? I think Hoggy on an Elephant should be a post all by itself. KC is failing to keep his finger on the pulse of important cricket news. I did send it to him first, but it appears King, is a little too afraid of the big nasty boys at Cricinfo..
Maybe they steal his lunch money, and give him wedgies. They probably make him do their homework too. I’ve been to Pinnawella. It’s the best. Last time I went, one big elephant didn’t want to have a bath. Then, when all the other elephants had finished their riverbath and were being lead home, he THEN had a bath. It turned out that he just wanted the river to himself. Sadly hoggys once stella strike rate has become merely outrageously good, now at a simply outrageously very good 55 instead of the best there ever was of 53.71.